Terrorists freed in Shalit deal fared well in the group's internal elections. 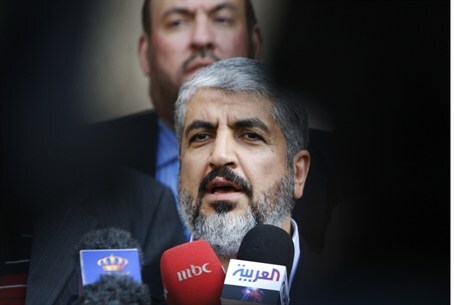 Hamas will publish the results of its internal elections in the coming days, and Khaled Mashaal's faction is expected to emerge victorious, according to a report by The Meir Amit Intelligence and Terrorism Information Center (ITIC). Among the candidates elected to the Hamas Political Bureau are senior terrorists Yihya Alsanwar and Ruhi Mashtaha, both of whom were released in the Shalit deal and allowed to return to Gaza. Other terrorists released in the Shalit deal were elected to the General Shura Council in Gaza. The ITIC explained that the results indicate that the freed terrorists have been quickly integrated into Hamas activity and were received with appreciation by the movement's activists. According to the ITIC's analysis, the election results show a strengthening of the Gaza leadership vis-à-vis the top Hamas officials in other places. This can be seen in the election of Gaza's Ahmed Aljaabari and Marwan Isa to the Political Bureau.